If you check your Google Webmaster Console, you’ll notice a new tab called ‘Link’. This is a wonderful tool to help you find out all the links to your page on your site that Google found on the web. Sure you can do this with the link: command but the webmaster link tool is much more comprehensive and can be classified, filtered and download. According to Google, this reason why the link: command shows a lower number of links was mainly for historical such as limited disk space on the machines Google served up “link:” data. To use the Google link tool, you need to login to your Google account and verify ownership of your site with a html file. It’s quick and easy. I ran a quick test and indeed I don’t think there’s a better (free or paid) link back tool out there. The link command pointed out that there are about 167 linking to Sabahan.com at the time of this writing while the link tool indicated 9058 external links are pointing to it! But before we start celebrating on this monumental achievement, I think we all need to keep in mind what Matt Cutts, the Google engineer has said about this link data. Do not assume just because you see a backlink that it’s carrying weight. I’m going to say that again: Do not assume just because you see a backlink that it’s carrying weight. Sometime in the next year, someone will say “But I saw an insert-link-fad-here backlink show up in Google’s backlink tool, so it must count. Right?” And then I’ll point them back here, where I say do not assume just because you see a backlink that it’s carrying weight. All links are not created equal. While the number of links you have may indicate how much your site has grown to some extent it doesn’t indicate that you page has improved in authority. Of course one can start extending the argument to the Technorati analysis I did previously. 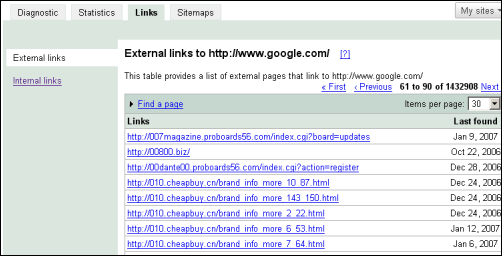 But then again, the Technorati analysis is confined mainly to the blogosphere while the Google link analysis tool isn’t. The blogs linkage system is different from that of the larger web. On a related entry, Google Blogosoped had found a bug that lets you see all the backlinks of unverified sites too. This bug has been fixed by the way and won’t work anymore. Previously, this allowed them to check all backlinks for Google.com or any websites for that matter, and download the links table as CSV file. You can find more information on how to use your link tool from the official Google Webmaster Central Blog.